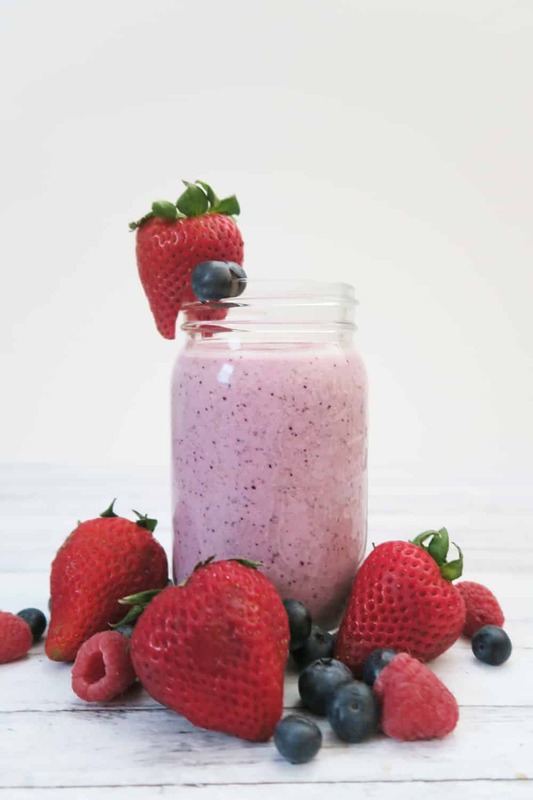 This three berry smoothie with almond milk is a delicious creamy combination of strawberries, blueberries, and raspberries mixed with yogurt. A treat to your tastebuds! Smoothies are one of my favorite breakfasts, especially when I’m in a hurry. They’re quick and delicious, easy to bring with me, and a fantastic way to pack in the protein, fruits, and veggies first thing in the morning. We started on a smoothie kick a few years ago. While we had obviously had smoothies prior, it wasn’t really a thing. But we went to Florida and came back ready to go smoothie crazy. After a handful of nights waking up to the infomercials about superfoods and crazy blenders, we came back excited to really get into smoothies. And equally excited to finally put our Ninja to use. But the funny thing is, this berry smoothie with milk was first created from what we had left in the house. We didn’t want things to go bad and our options were pretty limited as we had flown through all of our regular smoothie ingredients. 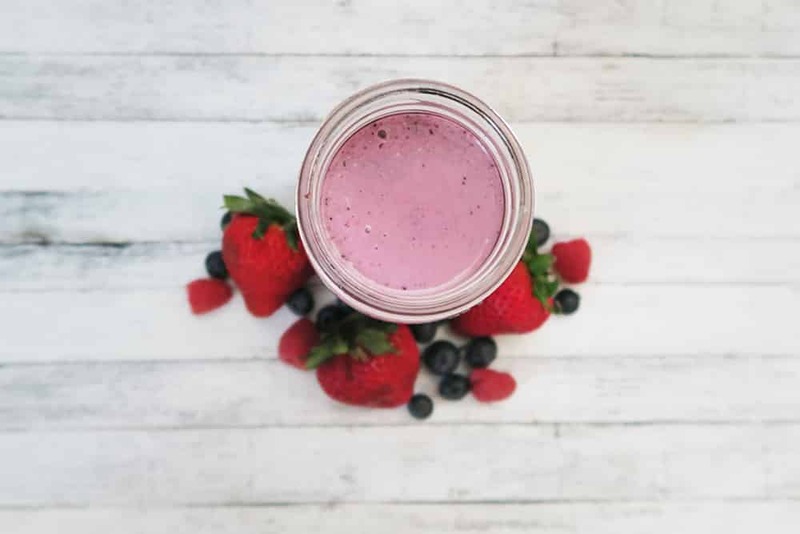 So while this three berry smoothie came out of a little bit of desperation, it’s now in our regular rotation of quick smoothies because it was that good. 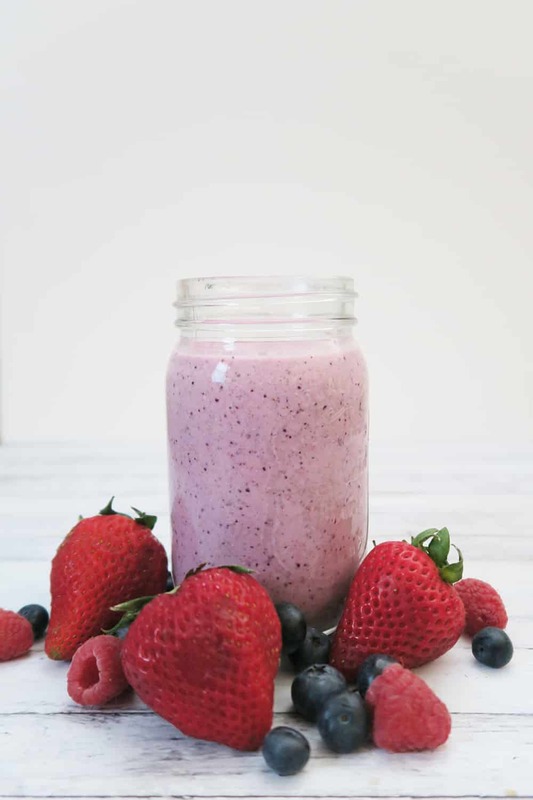 Before I get to the delicious three berry smoothie recipe itself, I wanted to talk about our blender real quick. We used to have a pretty standard blender. Nothing special. It just… blended stuff. Then we decided on it was time to upgrade because we found a great deal on the Nutri Ninja Blender. Seriously. I had no idea that our old blender sucked that badly. You may think that the blender doesn’t matter, but if you start adding in delicious things like chia seeds or nuts or oats, it matters. A lot. 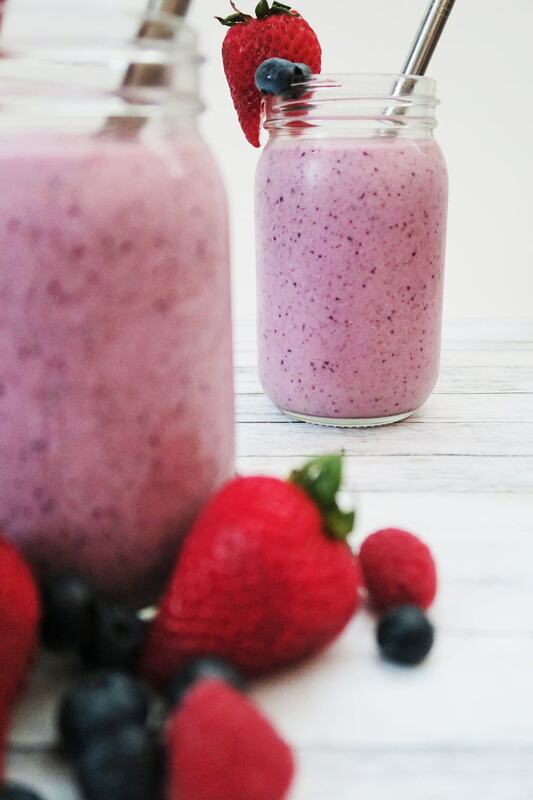 And that blender makes this creamy ninja berry smoothie even better. The flavor combination is delicious with the variety of berries. And paired with the creaminess of the yogurt and almond milk, it’s kind of like refreshing comfort food for me every time I have it. 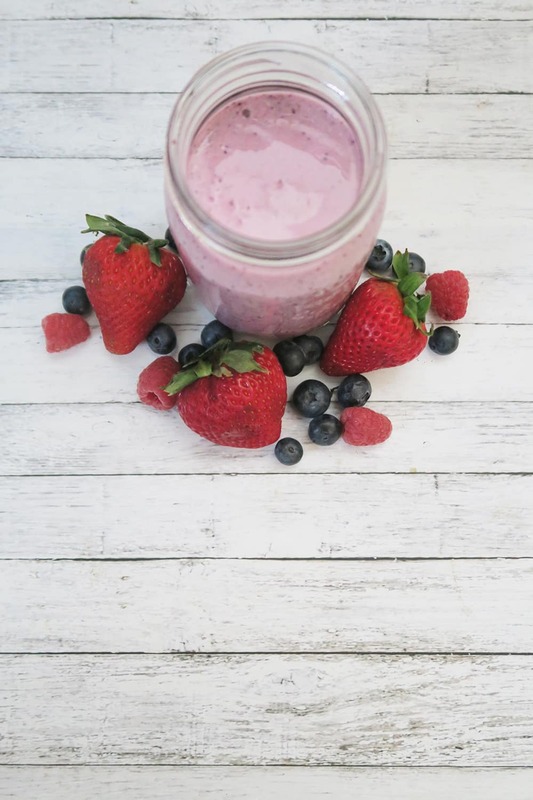 When it comes to these berry and yogurt smoothie ingredients, fresh and frozen berries work! We prefer the fresh berry smoothie, but we’ve also made it as a frozen berry smoothie. And no matter what, this triple berry smoothie is still delicious. And if you’re trying to kick this berry smoothie with yogurt up a notch, check out the optional ingredients in the recipe card. Things like chia seeds, sunflower seeds, and flaxseed. These ingredients make this super antioxidant smoothie even better! You don’t taste them, but they can add protein and omega 3s and fiber with little effort. Add the strawberries, raspberries, blueberries, yogurt and milk together. Blend. Add in the chia seeds, sunflower seeds, and flaxseed. Blend. Add in the ice and blend until thoroughly mixed. Add more or less ice to alter the consistency if you like a thinner or thicker smoothie. If using the Nutri Ninja, use the Ultra Blend at the end for a truly blended smoothie. Want to remember this delicious Three Berry Smoothie? Post this delicious drink to your favorite Pinterest board! I am going to make this for my little girls today! Sounds amazing! Berry smoothies are my favourite kind of smoothies! Love how you’ve added in the chia seeds, too. They’re my fave smoothie booster. They really are an awesome addition, Nicola! This looks so yummy! I love your photography btw, so crisp and bright! Thank you so much, Theresa! I really appreciate the compliment! I LOVE putting chia seeds in my smoothies. I have also been trying smoothies as breakfast replacements in these early parenting days. 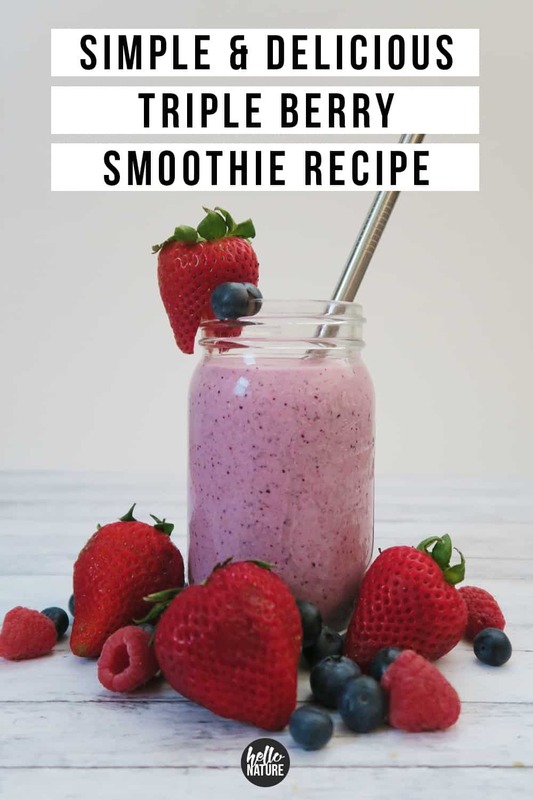 I’ll send this to my husband because he’s always looking for more morning smoothie inspiration! Me too, Jeni! They’re a great addition. And smoothies are a delicious way to get some good food in and not eat it cold ;) I hope your husband enjoys it! Berry smoothies are my absolute fav!! I’m so going to try and make this for me and my hubby! I hope you both love it, Rachel! I’m such a smoothie girl! I love all the different berries you use & how you included chia seed. I love the texture it gives beverages. Definitely trying this recipe! I love berry smoothies. This looks so yummy and refreshing. I love everything about this smoothie!! Never would have thought to add sunflower seeds. Can’t wait to try since I have almost everything! Tfs! Thanks, Alysha! It’s a pretty good one! The sunflower seeds don’t add much flavor, but they’re great for adding some extra vitamins! 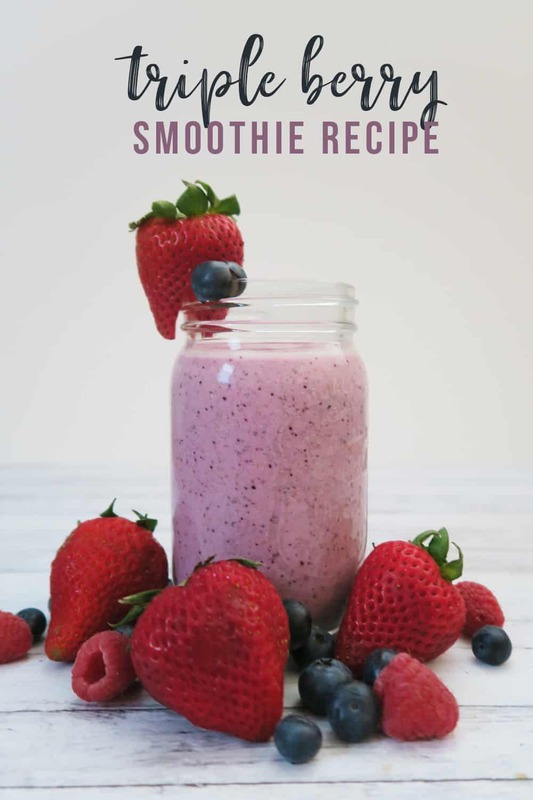 Saving this to make next week, I plan out my weekly meals for the family and smoothies are always a breakfast item, this one will be on the list for sure! This looks amazing. Smoothies are so great for getting in more fruits and veggies. Plus way less heavy food option to start the day. I still haven’t tried chia seeds but flaxseed is my jam! They really are, Dia! I love having something that doesn’t leave me tired right away for breakfast! Looks really tasty – perfect breakfast! Pinned~ Thanks for sharing at the What’s for Dinner party! This looks great! I make a fruit smoothie every day in the summer. :) Thanks for the recipe. Yummy! I never thought of adding sunflower seeds to my smoothies, thanks for the suggestions. Thanks for joining the Creative K Kids’ Tasty Tuesday linky party – I look forward to seeing what you share next week! Sounds yummy! I can’t wait to try it! Thanks for bringing this along to Fiesta Friday! Perfect for summer! Thanks for sharing at the #InspirationSpotlight party @DearCreatives Pinned & shared. 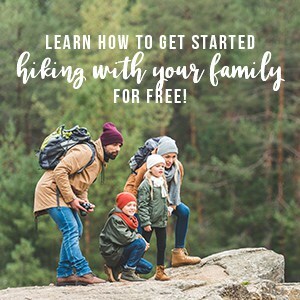 Your post has been featured on Full Plate Thursday! Thanks so much for sharing with us, we have really enjoyed it and we hope you enjoy your new Red Plate!